It is July of 1944 AD. The chances that you are here in the holy nation of Vatican City means that you were summoned by one of my agents. This means that you have been observed by the Aeons, an agency that works for the Church. Despite our usual views on sorcery, slayings, and the like, the Aeons have once again called for a special group of people that have a high magical and psychical potential. The reasons why you have been chosen vary from a deep devotion to your faith to totally personal raison d’être; like removing a curse. Since you have come this far, all you have to is take care of some bad blood that exists in this world. You see, ever since the massive slaughter of many innocents due to the Great War, nearly twenty years in the past now, a great increase of undead and other demons have revealed themselves to the world. Now with the increased rate of death, 7 beings called the Sins have awoken and are seeking their final sister. For now, they remain in the shadows, feeding off Allied and Axis soldiers a like. We also have to be mindful of the Germans and their control of the lands that surround us. Mussolini has fled and is somewhere in the north. Rome itself is being fought for as I write this letter. Supernatural agencies from both warring parties believe that the Aeons are a danger and will stop at nothing to stop you in your quest…No matter the dangers involved, we can grant you the one desire that you want the most in exchange for your hard work. Chose to continue and you will now be known as an Aeon. You are a part a strong agency that has existed since the time of the Crusades. We command you to kill the undead in our name. This is the price of your salvation to freedom. It is 1944. Mussolini has fled Rome and now the German Army is in the Holy City. With the occupation, an ancient society called the Aeons is summoned from the four corners of the world to help defend the Holy City. They are all people with magical abilities that have allowed them to stay hidden from Nazi agression for five years. Now with the Nazi backed Ghoul Society trying to break into Vatican archives, this could prove fatal to the ever approaching Allied forces. It is a tale of the supernatural during a modern war. 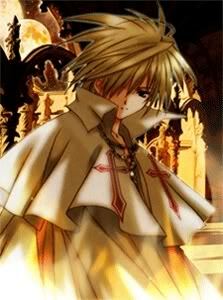 Abilities: Achille has no real magical style, besides for simple flame spells since he was never fully trained to be a magi. However, he has a rare talent of being about to sense supernatural movement, even if they are hidden. Revelation Detection: Achille originally was used to perform exorcisms. His eyes possess an unusual property; they act as a radar of sorts to find undead beings. Achille’s eyesight is significantly keener than that of most humans to the spiritual realm. However, this power causes him to see mostly in a grey tone; however, by looking into the auras of others, the various colors that are emitted allow him to know if a being is dark or not. Pursuer Sight: Once again, connected to his unusual eyes due to enhanced visual perception, with this power, he is capable of accurately aiming targets that are up to a mile away. As well, it allows him to have a clear focus on beings that are moving at fast speeds. Weaknesses: The biggest issue of Achille is that he is completely over reckless and besides for his fancy eyes he doesn't have much of a means to defend himself. Personality: Achille is a noble and thusly is fairly arrogant and a total play boy. Equipment: Like Tamara, Achille has a basic kit that contains Holy water and a stake made out of silver, which is a pure element that hurts evil. History: Achille grew up in Switzerland, his father a factory owner and his mother a religiously devout woman. He has been trained by various masters of Hebrew. For several years, he lived in Palestine where he became a member of the Nezach-Zion, an ancient Order whose beginnings and traditions are jealously guarded. He also became a member of a Zionist (Israeli) Supernatural Agency that is waging a war against the German Ghoul Society to help him develop his skill and fight evil. He supports the creation of a Jewish state in the British Mandate of Palestine. He has traveled to Rome under the disguse of a monk to act as a scout to the ZSA. Appearance: Sandy brown hair and always wears a brown robe. Abilities: Collen is a runesayer, otherwise known as a tattoo artist. He believes heavily in Celtic runes and has many symbols and prayers on his body. Many are meant for protection or good luck, from what he doesn't know. What he also doesn't know, though, is that these tattoos hold just a little extra something other than ink. Celtic Cross - The bridge that creates the passage to Heaven or Hell. This he has emblazoned on his right pec for protection from evil. Alder Tree - Guardian; foundation. This is meant as a beacon for his guardian angel, whom would give him the strength and perseverence to overcome obstacles. Tattooed neatly on his right hand. Triskelion - Competition and man's progress. Tattooed on his left hand, it is meant to help him be at his best and always improve in skill and experience. Triquetra - The three-cornered Holy Symbol of the Celts, representing holy trinity. This is his largest tattoo, which he has on his back, to protect him when he isn't wary. Single Spiral - Represents ethereal energy, and the expansion of consciousness. Tattooed on the right side of his neck, to keep his mind clear. Valnott - A symbol for servants of Odin. Collen believes that if his death should come, he should die like his ancestors in the past; brutally. Because of this he wears the Valnott over his heart. The Valnott itself has a history for having it's wearer's visciously murdered, thus Collen's reasoning. The affects of this tattoo have yet to be seen. All-Seeing Eye - Symbol of the Watcher, the omnipotent observer. Tattooed on his left palm to extract information in a kind way. Hammer of Hephaestus - The Smith of Olympus, the God of the Forge. This symbol represents the necessity of a weapon, and the importance of it's wielder. Tattooed on his right forearm. "Vocatus atque non vocatus Deus aderit" - Translated; Invoked or not invoked, the god is present. A tattoo just under his belly-button. Runic power, if any, is unknown on this tattoo. Collen is stoic. He thinks things through before doing something risky and always keeps his avenues open, just in case. Hence, when faced with a situation that requires quick-thinking, he is caught. Collen has a trick right knee, having severely damaged it earlier in his life. Beyond that he has a no-tolerance policy for alcohol and opts to drink water and juices. Personality: Being a stoic and slow-moving but purposeful individual, Collen enjoys the way things are. He's used to a tough and bitter lifestyle, not minding if money is tight or business is slow. A simple man with simple tastes, satisfied with the complicated pieces of art he crafts on himself and others. He is aware of the superstitious, but keeps to himself when it comes to opinion. Constantly makes references to his mammy and pappy. Some may find him morbid with his stoicism, for he even sounds sadomasochistic at times. Equipment: Collen is dedicated not to bring anything with him but a small crucifix and his needles and ink. Purposefully harmless, so as not to draw attention to himself. History: A poor and desperate life. A family that scratched at the bottom of barrels and fought even for the smallest of coins. Collen was the second-to-last born of a family of 7, named Collen out of respect for his dear dead uncle Collen, a rat and ugly sot. Mammy and pappy always gave him phrases and quotes to remember how to act, even though starving wasn't part of the drill. "Kindness is our nature, even to those lummox toe-blisters that we call neighbors." "A rapscallion has no taste, thus only knows ash and dirt. Corpses eventually become ash and dirt, so what is a rapscallion but a fiendish ghoul?!" "Under this mud and grime is nothing but a shell. Even angels fall, my child, even kings can crawl." The art of runesaying was his family's gift and pleasure. Collen was taught by both of his parents, and sufficiently warned not to use it on those undeserving of it's splendor or ire. His success was eventual from his apparent pictures and "artistic gift". Drudged up from the bottom of society, Collen made his living drawing and painting amazing landscapes. Time passed, people moved on to newer art, and Collen moved back to doing what his family always did; scratch from the bottom of the barrel. Now as a traveling tattoo artist, he lives out his life for whatever reason. 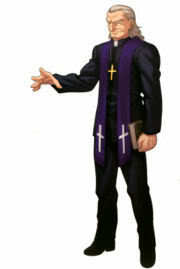 Appearance: Although a high ranking member in the Church, St. Clair still dresses like a low level priest in black robes. St. Clair is a fairly well built man, tall, though not overly so, and well muscled due to years of combat training. The Archbishop has eyes that are very deep, a dark blue surrounded by green, that are atop a face that, while rugged, displays a sense of majesty. Abilities: Sonic and mental manipulation. This power, as described in the name is capable of changing the mindset of a person with his voice and mind, he cannot enter the mind of his target of course, but with minimal focus he can bring an state of insanity to a weak minded person, prone to violence, already insane or simply, lacking a conscience, but still having a brain that passes orders trough its nerves to the rest of the body. Its effects can also dwell into the fields of delivering paranoia, as hallucinations can be created once he knows his target has lost the grip on reality, and the border between an illusion and the true sights are as visible as the wind. This power does not only come from his mind, obviously, as his bone structure and musculature -Specially the are around his neck, for obvious reasons- is stronger than normal, to resist the subsonic waves of sound and reverberation it creates on his flesh and bones. Weaknesses: His ability can't be used all the time, obviously lasting until he runs out of breath. He can target someone, to the extent of draining his voice and strain his mind. Specially the latter, he is affected by his own powers, hallucinations and bouts of paranoia are there to hit him in the times he doesn’t need it, like when he’s straining himself with his powers. And most probably an ongoing post-traumatic stress disorder from the war. Personality: He is very anti-Nazi. St. Clair is very protective of Tamara even though he distrusts all other Germanic people. He will seem very loosely connected to any person around him until he feels that he can trust them. After which, he will see any threat and eliminate it to keep himself and anyone that he trusts safe. Also hates brash young men. Equipment:3 long swords that are made out of silver. History: St. Clair has been a member of the Church for many years, first seeing action in the supernatural thirty years before the start of the plot during the First World War. He served as a Chaplin for French army. After seeing his hometown of Lille, France being occupied by the Germans, he grew to resent the Botch. In the post war years he distanced himself from the Italians, focusing his sole attention on the strange red haired girl he found on a journey in Cairo, whom he named Tamara after a woman in the Book of Genesis. Since the start of the war, he’s been rounding up various people from all sects to unite together against the common German foe. Age: Unknown, absorbing mana keeps her youthful. 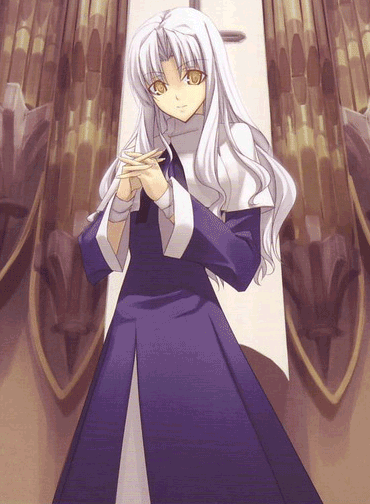 Appearance: Long silver white (ash blonde) hair with bangs just over golden amber eyes. Pale skin, thin figure and an etheral appearance. Silva looks like a living angel. Presence Concealment: Silva, being a mixed blooded being, can invoke her powers to conceal herself to the point that is possible for her to almost disappear completely. Thusly, making it almost impossible to spot her without the ability to see into the spirit world. This power also allows her to conceal her true nature from the sight of most people, save for telepaths or psychics. Mana Destruction: An attack in which Silva literally dries up the mana of the environment by absorbing into herself. This prevents all forms of human magic from being used in a general area. This also severely weakens demons. However, if she uses this attack her body will be destroyed in the process, due to her inability to properly maintain mana. Contract Breaker: Silva’s final ability is to break contracts demons make with other humans. This seems to suggest that Silva’s ancestors dealt with many daemon class beings. She can only control beings that are weaker than her Familiar; however. This leaves the demons the Aeons are currently fighting out of the picture and the demons within the TOME OF INQUISITION out of the question. Weaknesses: Silva must maintain a proper amount of mana within her body at all times. The ancestor's of her family mixed a demon's blood into themselves in order to achieve power, making her vampire like in nature. Unlike Tamara’s case, the blood was added by spell, rather than breeding. This makes Silva’s mana level fluctuate at extreme levels. In order to survive she must drain the mana out of others. Depending on the amount of mana absorbed, will determine if a person shall live or die by her hands. She prefers going after villainous people, but this cannot always be the case. Personality: Silva is a woman that is masking her true emotions. She appears bubbly and carefree to the Aeons because she believes that is how they want her to act. Silva however, has one goal and that is, just like Tamara, defeat Solomon Griefbone. She believes that by slaying the demon, her powers will stabilize to the point, where she won’t have to absorb other’s mana. Silva believes that good and evil are just a part of nature and thinks that it is her duty to prevent suffering. She will use her powers on anyone that she deems needs “salvation” from this world. Compared to her familiar, she is not evil, rather indifferent. Her greatest joy is to play on the Church’s organs. 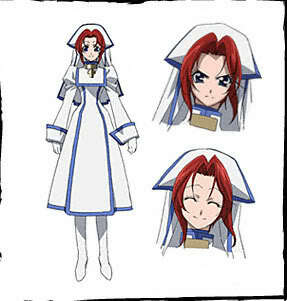 Equipment: Silva owns the Blue Robes of the Sisters, which is the uniform she wears most of the time. Her possessions will vary to her various duties that St. Clair sends her on. Most of the time, she only carries a small case of food on her person. History: Silva’s past is kept hidden by the Church, so she is only allowed to mention so much about herself. First spotted by the Church sometime during the First Balkans War in 1912, she served with the Nurse Corps of the Bulgarian Monarchy. She was often called an “Angel of Mercy” by the men around her because with her touch, the wounded soldiers would feel no more pain. However, has her powers increased, she started to have issues keeping the men awake. Many slipping into deep, almost lifeless sleeps. Often spotted with a strange succubus named Lala, the “Angel of Mercy” continued her journeys ‘healing’ wounded soldiers of both sides. However, she was captured by the Turks and until the break out of the Great War, in 1914, she was kept somewhere in the Eastern half of Europe. However, with the entry of Germany in the War, the Turks handed her over to the Bavarians, who then sent her to Rome. Knowing that she might be helpful to the Aeons, a younger St. Clair accepted her into his ranks and she’s been there ever since. Nationality: Succubus the second circle of Hell. Abilities: Lala is a Lesser Daemon. The Lesser Daemon form uses basic spells to confuse the enemy. Lesser Daemons use illusions techniques and status effecting spells. This form hardly deals damage directly to the opponent’s health. Lull: Lulls enemy into a light slumber. Confuse: Uses a high ultrasonic shriek that scrambles the opponent’s senses. Poison: A highly toxic poison is secreted through glands on the lips. Direct contact on any part of the body will poison the opponent. This poison sloyl immobilizes it's prey, and slowly closes the air ways, thus suffercating the victim to death. Weaknesses: Lala has a weakness to light; while light cannot kill her, it weakens her significantly. Also Lala has the Succubus’s mark, which is a birthmark in the shape of a pentagram. These marks are on all demons and are the spot where all magical energy is absorbed. If this mark is touched, then the demon will become extremely weak and lose ALL magical abilities. Lala’s mark can be found on her inner thigh. Lala also has a weakness for sweet things. Personality: Lala is playful and comes off very sweet. She is very naughty and prone to tell innuendos but she is a succubus after all. Lala is also very rebellious and stubborn and can be very hard to deal with if she doesn’t like you. Lala can also be very childish. But all of this is a cover for Lala’s true sinister nature. Lala is very cunning and quite the sadist. She can be cold and calculating as well as sinister and downright evil. Equipment: Lala uses her claws and her tail as weapons. History: Lala is Silva’s familiar. Silva and Lala have been together a very long time dude to them both being immortals. Lala basically goes with Silva everywhere she goes. A very long time ago Lala was summoned by Silva and then was tricked into entering a bond with her. Therefore Lala must guard Silva, and refers to Silva as “Mistress”. Lala also aids in helping Silva feed, by putting all of her prey to sleep. Silva is the only person Lala takes orders from. Nationality: Proclaims to be Austrian; however, Tamara is in fact a Nephilim. The Nephilm are the offspring of Seth. The Qumran (Dead sea) scroll fragment 4Q417 contains the earliest known reference to the phrase "children of Seth", stating that God has condemned them for their rebellion. In the Biblical era, they are called the Giants, not because of their height but because of their power. Age: She appears to be around twenty years old, the age at which her Nephilimic blood first shown its full signs of kicking in, it is due to this fact that her true age is most likely not known. To describe a Nephilim as being almost angelic in nature would seem to be slightly blasphemous. However, there is no other word that fits Tamara. She is seemingly made of the purest of marble and her skin is uniformly white. She tends dress in blacks or dark blues, often to accentuate her skin tint, which often gives an aura of startling purity to Tamara. Blind Seraphim’s Claws: Tamara’s hands turn from a human to being sharp like claws. The roots of this power comes from her Nephilimic background. If all her other weapons are lost, she will use this as a last ditch effort to escape. Tamara’s greatest fears are that her Nephilimic powers will consume her soul and mind. Wanderers' Charisma: Another one of the Nephilimic powers that she holds. Her eyes turn from brown to red. This allows her to strike fear into the hearts of her enemies because in her world, Nephilim are a rare breed and many feel that one look into these eyes will grant the ability to plant suggestions in one’s mind, such as blending in with her surroundings. Again, Tamara is afraid to use these powers and will rarely use them. Weaknesses: Her body is similar to that of an ordinary human being since she spends most of her powers suppressing whatever it is that she fears of herself . She can still get hurt and requires everything humans need to survive. However, with the Nephilimic blood in her veins, she has several more issues to worry about. No one could ever confuse a Nephilim for a human or, at least, not for long. It's not that they're inhuman-looking - they just don't act human. Also, Nephilim tend to fall rather hard in love - inexperienced as they are with emotions. This makes for disastrous results at times, especially when the potential lover is incapable of reciprocating the same feeling (for whatever reason). Personality: Cute and meek. It is often said that Tamara seems disoriented on the surface, which unconsciously conceals being humble. She has a younger sister persona to herself. On a deeper level, she is, in fact, moderately emotional and enormously easy to set off. If enough of this emotional conflict enters her brain, it will switch over to a more aggressive state. Then her mind is merely filled with a desire to kill, and has an instinctual knowledge on how to do it. It is this fear of turning into a mindless murderer that causes Tamara to hold back in many battles and things that she does. Tamara also likes to talk more in German than English; however, she is well versed in both languages and will use both. She also can speak limited Latin, due to her role with the Church. Equipment: Her basic kit contains Holy water and a stake made out of silver, which is a pure element that hurts evil and a few other personal belongings. History: Her past is kept a hidden secret from all, except for the Archbishop himself. Tamara also put a forced amnesia spell on herself, so no one from other religious organizations could track her movements. She has adopted Silva as her guardian and has been fighting the supernatural so she can be set free from herself.